well, i checked out the show at hooter's, el toro today. maybe i didn't stay late enough, but there didn't really seem to be that many cars. small collection of pt cruisers all spiffed up, which really isn't my bag, but there were enough of the classics to satisfy. i recognized quite a few cars from other shows—even one from downey. actually glad to see them at different times of the day—different light, different look for the same car. 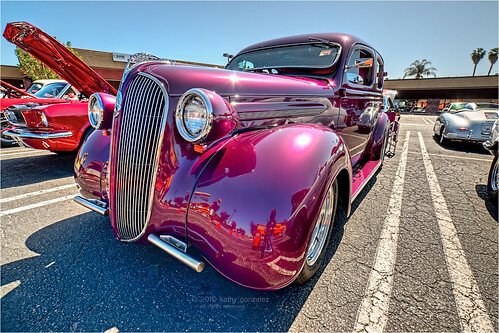 i recognized the color and the grill of this plymouth as soon as i got there, from one of the fuddrucker's shows i've been to before, being such an unusual shade of red raspberry purple. i happened to have a little close up picture of his grill with me, and handed it to the owner, who happened to be nearby. he seemed very appreciative, and even said he'd been checking out my website, though i've never talked to him before. word must be getting around, i guess. glad its a good word.